The Horus System is best known for two things: its two jumps into the Xi’An Empire and Serling, a tidally locked planet with one of the most unique human habitations in the universe. For years, Horus’ connection to the Xi’An Empire made it a part of the Perry Line, a string of no-man’s-land systems that provided a buffer between the species, a status that cut off any public access or private development to the system. Now those connections are its biggest asset, making the system an intriguing prospect for those interested in doing business with the Xi’An. Horus was officially discovered in 2528 by a then-unknown navjumper named Marie Sante. Legend claims that the system was actually discovered several years earlier by the fourteen-year-old Sante after she stole a ship to flee her family in Gonn. If true, she must have spent the majority of the intervening years in the unclaimed system, alone on her ship, as extensive checks of UPE records and landing registries have failed to uncover her name anywhere during that period of time. The UPE’s first official record of Sante was her application to register the discovery of the Horus System, which she, maybe tellingly, requested be named after her ship. Included in her initial application were meticulous documents describing the system’s three planets and two asteroid belts. Apparently, Sante had spent years alone in the system exploring before she finally decided to share her find. This resulted in Horus being the only system to have been discovered and have all of its celestial bodies charted by the same person. Sante’s single-minded interest in uncovering all Horus had to offer was both her greatest strength and her ultimate downfall. In 2530, only two years after Horus’ registration, Humanity first encountered the Xi’An, and tensions only escalated from there. Meanwhile, as public and private interests established operations in Horus, Sante stuck to its outer reaches, singularly focused on the areas she had yet to explore. In 2542, Sante discovered the jump from Horus to the Rihlah System. To this day, historians debate whether Sante understood how reporting Horus’ connection to Xi’An territory would drastically alter the system’s future. At that time, the jump to Rihlah made Horus a security risk for the UPE. The government closed the system to non-military personnel, receiving little resistance from the small group of civilians that had begun to settle on the fledgling planet of Serling. Only Marie Sante defied the order. She hid in the system’s outer reaches and managed to remain undetected until a Navy pilot reported an unauthorized ship in his sector. A battle group was mobilized only to realize that the ship had been Sante’s. With the false alarm wasting many hours and credits, the military prioritized pushing Sante out of the system. To this day, no one is certain of what fate befell Marie Sante. The last record of her comes from a recovered info-beacon containing her journals. The final entry was dated 10.1.2545. In it she expresses her belief that Horus had more secrets to uncover, which proved true with the discovery of a jump into the Xi’An controlled Kayfa System in 2617. Her final entry ended with “Horus is the only home I’ve ever had. I shared the world and they took it from me. Let’s just say I’ll never make that mistake again.” With those final words, Sante was never heard from or seen again. To this day some believe Sante spent her remaining years hiding in the system. Everyone from novices to expert explorers, and even Spectrum show hosts, have tried to piece together clues from her journals to uncover her ultimate fate. A portion of Horus’, albeit small, tourism sector focuses on this mystery, with ‘history hunters’ eager to locate the remains of Sante’s lost ship. Meanwhile, as the UPE was transitioning into the UEE, the military maintained control over the Horus System throughout the cold war. Assignments monitoring the system’s two jumps into Xi’An territory were both strategically essential and extremely dull. A lack of hospitable planetside locations meant military personnel spent their deployment in either their cockpit or a capital ship, which did not endear the system to starmen. Once the cold war ended and the Perry Line was dissolved, the UEE decided to use the system for more than just military patrols and exercises. The public finally had another chance to put its stamp on the system. Unfortunately, inhospitable planetary conditions have kept the population down, and minimal natural resources have made heavy industry slow to develop in the system. Yet, its connection to the Xi’An Empire, which once doomed it to isolation, may now be Horus’ strongest selling point. Businesses looking to capitalize on improved relations and increased trade pay ever-rising real estate prices on Serling to have an office only one jump away from the business-friendly Rihlah System. While the future may be bright, many within the UEE still considered Horus an afterthought, a system that has yet to exert enough political or economic force to earn recognition in the UEE Senate. "While we will never know for sure what drove her there, Sante’s journals make it clear that she truly loved two things in life: her ship and the system she discovered." "Before we sing the chorus, let us speak of Horus, a system sure to kill us, from boredom, not from war!" Horus is a Main Sequence Dwarf-M star. A massive planet-wide desert with no surface water bodies. The planet is currently not habitable by Humans, but it's a condition that UEE surveyors and scientists are reviewing very carefully. One of the few super-Jupiters in UEE space, this high-density planet is on a long orbit around the system's star. 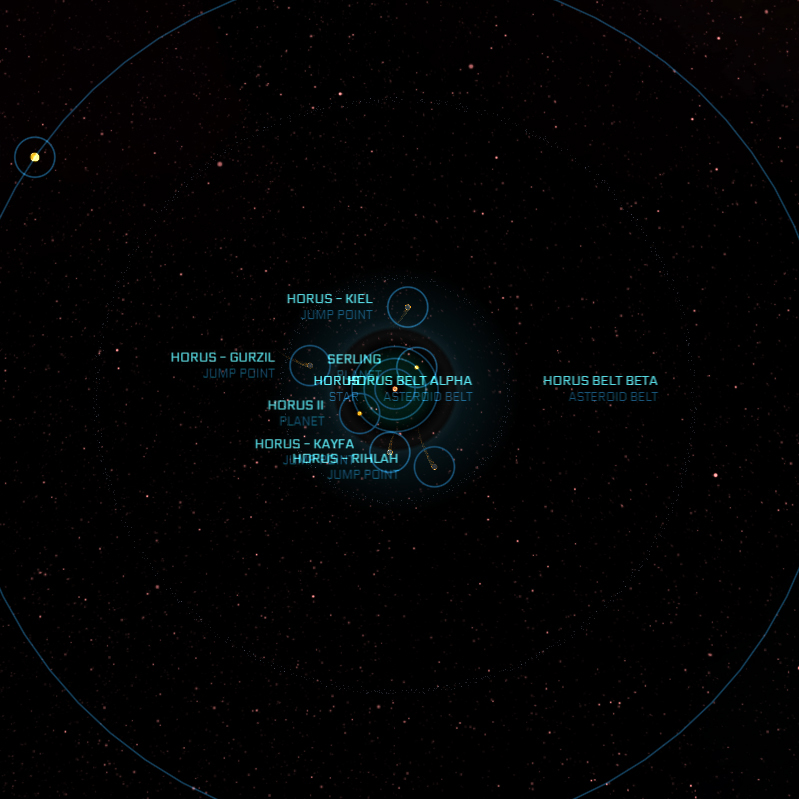 The Horus system contains two asteroid belts. Both Belt Alpha and Belt Beta are located between the orbits of Horus II and Horus III.